Not only Venus Williams surprised us with her new dress (as usual), but also with an unexpected pulling out of the tournament. Venus said she had recently been diagnosed with an energy-draining autoimmune disease, Sjogren's syndrome, which prevented her from going forward in the tournament. As for the dress, it's, as usual, strange. The front looks more or less classy (however a high-waisted dress makes Venus heavier than she is), but the back spoils everything. As columnist from Bleacher Report points out, "a small black dress looked straight out of the early 1900’s in the back... It’s more suited for an old lady that isn’t competing against the best tennis players in the world". 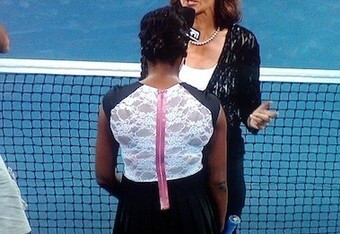 And even if we can pretend we understand white lace back, the pink zipper looks absolutely tasteless.